Inspired by the Knights Hospitaller, the Knights of St. John Open Guard Arm Dagger features complex engraved and symbolic detail throughout, including a pommel shaped like a medieval helmet and cut-outs within the arms of its guard. Made of stainless steel, the decorative dagger blade is attached to the ornate guard featuring a large eagle emblem at its center. The arms of the guard flare out in triangular shape, hollow at their centers. Attached to the rounded, black plastic grip is the knights helmet pommel, which features a minute dragon upon its side. 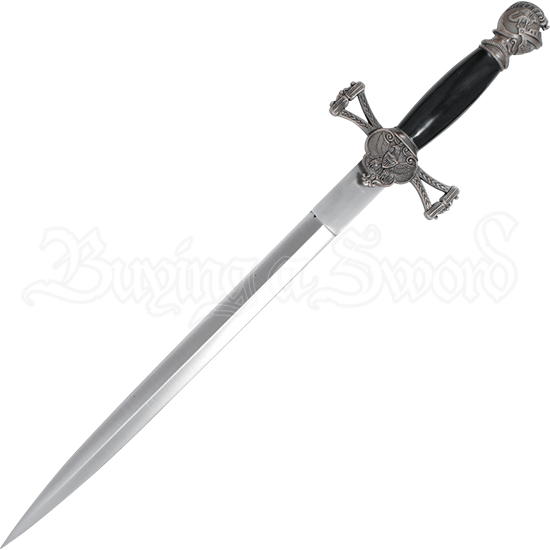 With an included matching scabbard made of black plastic and capped with ornate stainless steel fittings, this Masonic dagger makes a fantastic collectible or gift for fans of medieval history and knighthood. Display it in your own home, present it to a loved one, or use this unique Templar dagger for ceremonial purposes.